First of all ‘CV’ stands for ‘Curriculum Vitae’ which means ‘story of your life’! But in this context it means a brief written account of your career so far. The intention is to sum up all the basic information that an employer needs to know in one short and easy-to-read document. 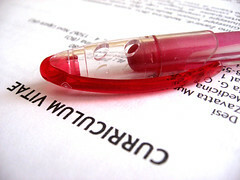 Once you have written a basic CV you can then make as many copies as you like and send them to anyone you wish. But more importabtly you can then adapt this basic template to meet the needs of any particular job advert. You can send a copy of your CV when you’re applying for a specific job vacancy or when you’re just writing ‘on the off-chance’. What information should be in a CV? The order may vary depending on the opportunity you are applying for. There are different ‘styles’ of CV? A ‘traditional’ CV lists everything in date order starting with your education and qualifications, followed by your employment history, interests etc. A ‘more ‘informal’ CV starts that starts with a pen picture of yourself which highlights your skills and experience relevant to the job. The more informal CV is now fashionable, traditional CVs are more likely to be required for academic institutions etc. I’ll be writing more about this in my follow up posts. But I’d welcome your thoughts on writing CVs and your questions. Wendy Mason is used to working with people moving out of the Public Sector! She is a performance, programme, contract management and change specialist. She works as a consultant, business coach and blogger. Adept at problem solving, she is a great person to bring in when you are going through personal change. You can contact Wendy at wendymason@wisewolfcoaching.com or ring ++44(0)7867681439.